I've been holding on to this sweater for a while just waiting for a worthy pair of pants to come along. I was going through a some things I already had and came across these linen pants, so I decided simple is better. What really drew me to this sweater was the sheer panels. I love how modern It looks and really helps to change it up a bit when it comes to pullovers. It's on sale now so use the link above to snag one of your own! 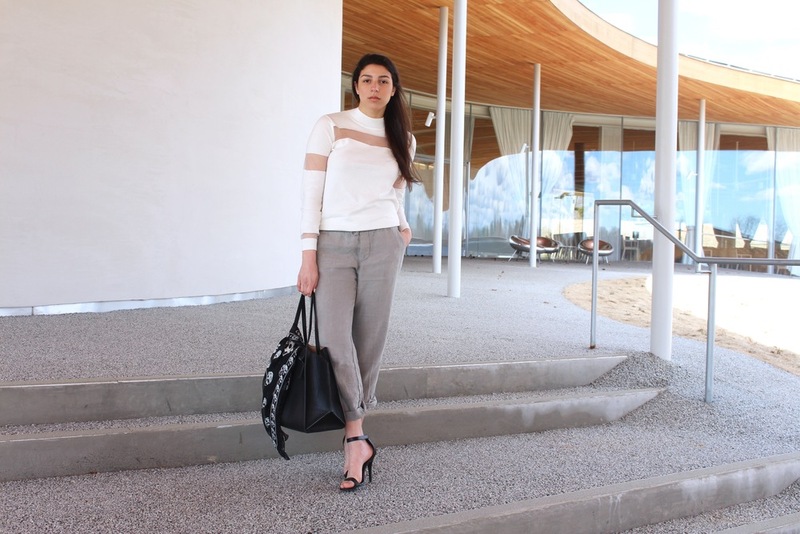 To complement the modern look of this sweater, I wore it with a very clean and simple pair of linen pants, a structured bag, and minimal heels. The location also helped to portray the minimal feel I was going for. This look is perfect for this time of year especially on those warmer days. Not only do I find this look to be chic, but it's also so comfortable! Earlier in the day, I wore this outfit with a pair of stan smiths to make it more casual. I've been getting a lot of use out of my McQueen scarf because it is so versatile. Definitely worth the investment. I would wear my favorite stan smiths (like I mentioned above), and a pair of black jeans.